On top of his burdensome new tax levies and appropriation of estates, which alone were enough to arouse his subjects to hatred, Maximinus added the offense of many murders. Anyone who opposed or insulted him he killed without hesitation. His contemporaries say that, in an attempt to erase the memory of his humble beginnings, he even caused the disappearance of many who had initially supported his rise to power, simply because they knew him when. . . . The public, reacting to all this, began to refer to Maxi-minus sneeringly as "the Cyclops,"116 "the Busiris,"117 and "the wild beast," and men openly desired his death. Beware of the many, if you fear not one alone. "This is to give notice to all gentlemen, ladies, and others. That there is just arrived from France, and is to be seen at the Two Blue Posts and Rummer, near Charing-cross, a giant, born in Saxony, almost eight foot in height, and every way proportionable; the like has not been seen in any part of the world for many years: he has had the honour to shew himself to most princes in Europe, particularly to his late majesty the King of France, who presented him with a noble scymiter, and a silver mace." 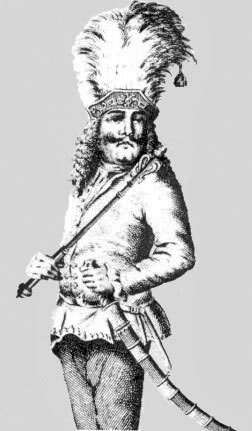 MAXIMILIAN CHRISTOPHER MILLER appears in this etching wearing his cap topped with a plume of feathers and the curved sword that Louis XIV presented to him. Miller actually stood seven feet eight inches tall, but his velvet cap, with its large plume, made him seem taller. He usually wore a Hungarian tunic, and always at his side swung the curved, single-edged sword that Louis XIV gave him. Dressed thus, he would appear dramatically in a draped doorway, strut briefly among his patrons, then suddenly vanish, leaving them "clamoring to see him again."